comics zines, prints and illustrated gifts! Announcement Your ultimate destination for COMICS, illustrated bags, prints and anything else you can imagine! 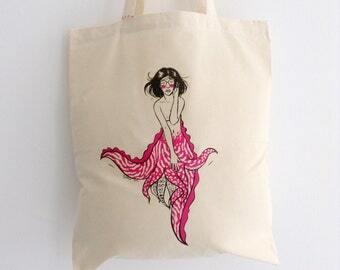 Your ultimate destination for COMICS, illustrated bags, prints and anything else you can imagine! This was a present for my boyfriend and he was thrilled with it. It was very well presented and in great condition. Very happy. I was at Glasgow Comic Con last weekend! My quirky mermaids came with me they are ever so popular, stealing hearts of gents and ladies alike. It's all done by hand, one line at a time! Hello! My name is Zu - pleased to meet you! I love drawing and this is always been a huge part of my life - not sure if I would call it a passion, it just is something I seem to do ALL the time. I always thought it would be great to be able to make living from my art, and few years ago a friend of mine told me about Etsy! It wasn't for a while though until I started to actually use it. I also have a strange fondness of being photographed in engine rooms on ships. Below you will hopefully find answers to all of your questions. If not, please don't hesitate to send me a message! You have 14 days from receipt of the item to return it. Please contact me before just going ahead and sending it back! It is the customers responsibility to get the item back to me and the shipping charges will not be refunded. Custom orders are non-refundable, but I will ensure you are happy with the product before you receive it! All cases of lost and damaged items will be dealt with on a situation specific terms. Please don't hesitate to contact me if you are not fully happy with anything! At the moment I accept PayPal, Etsy direct checkout and Etsy gift cards. I ship within 3 working days (Monday to Friday, excluding bank holidays) FROM WHEN THE PAYMENT CLEARS, but I aim to do it next day whenever possible. I will not be able to ship an item until the payment clears! Shipping prices are a combination of packaging and postage charges. For most items it will be First Class postage within UK and Airmail everywhere else. Airmail can take around a week in Europe, and two to three weeks everywhere else. Often it's not that long though! Exception is original art, which due to uniqueness will be sent Special Delievery in UK or Recorded/Signed For everywhere else, to ensure it doesn't get lost! Shipping upgrades are available on request! Please be aware that outside of European Union you may need to pay customs fees for the items. Brooches are packed in a combination of cardboard and bubble wrap/bubble envelopes. Bags are shipped in bubble envelopes. Prints and art sized A4 and less will be shipped in cellophane sleeve with a cardboard back or in a "Do Not Bend" envelope. Prints and art bigger than A4 will be shipped in a postal tube. Please contact me via Etsy message or e-mail if you are interested in wholesale prices, custom orders etc! I am more than happy to do wedding favours, custom invitations or items to fit your specific requirements! Same goes for custom artwork, illustrations etc.